« Operatic eCards are Here! 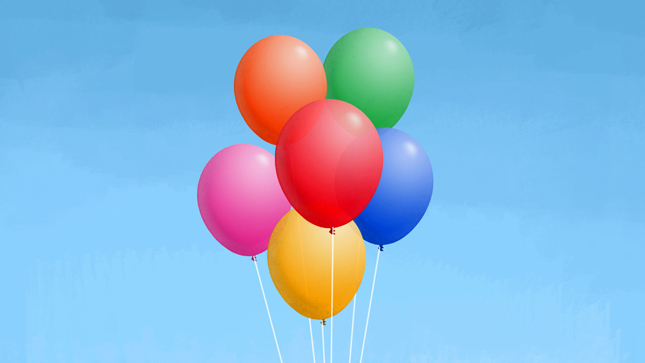 We’ve launched a snappy new 9 second eCard today that features a bunch of balloons! Though it may be short, you have no idea how much work went into making the card you see above. It all started when Evan wrote a zippy little song about birthday balloons, one of the most iconic Birthday images that we’ve yet to touch upon. After Ev recorded a scratch track of it, long time JibJab collaborator Steffon Moody punched the song up and performed it, then Evan went back and added some balloon popping noises. The first idea we had to bring the short to reality was to have the balloon singing after being released by it’s owner. It would end in a pop as a bird swooped by. 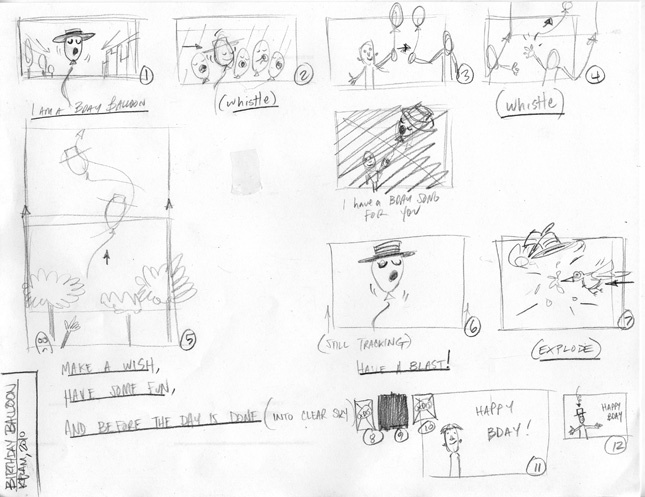 This idea made it as far as an animatic, but it was a little complicated to make traveling through the air look right. Anthony and Kevin tried using one of our puppets, taking the balloons outside to our parking lot. The result was just awkward, just watch them try to get that puppet to pop the balloon. 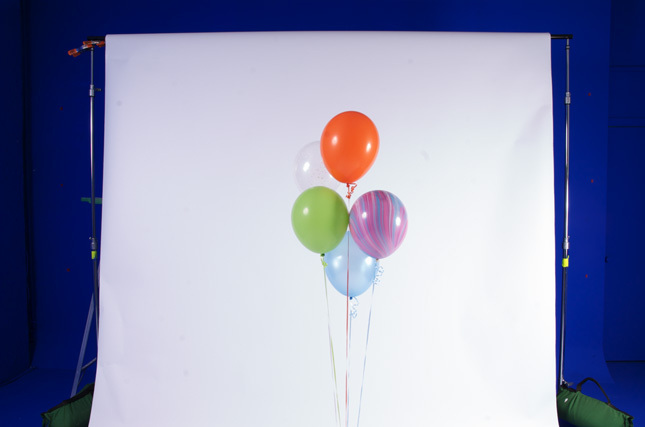 Tossing the idea of puppets, we took to our studio to shoot some balloons against backdrops. Only one problem, our studio lights shone brightly against the reflective balloons, making the messy half of our studio visible. 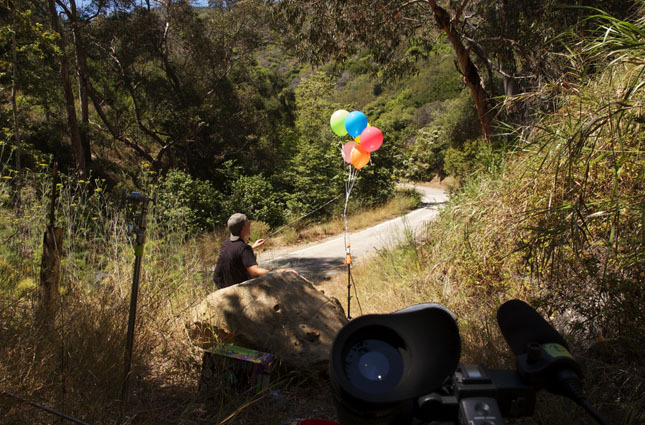 We would have to build a white wall of sheets just to block the lights and mess out, so it was on to plan C.
Taking the balloons out into the wild, we travelled to Topanga Canyon to capture some of Southern California’s beautiful natural landscapes. Unfortunately, we hadn’t counted on Southern California’s winds. We went to four different locations and came up with swift breezes every time. When the wind DID die down, we realized we had no good way to pop balloons that were hanging high in the sky. That’s Kevin poking them with a stick. We had given it our all, and when something can’t be shot in the physical world, it’s time to face the facts and go with animation. So Kevin drew up some funny faces and animated it. It did the trick! And that, dear JibJabbers, is how you make a simple, 9 second birthday balloon eCard. Stupid nature. Send it by clicking here! This entry was written by paulhanges and posted on August 31, 2010 at 7:20 pm and filed under Behind the Scenes, Production Art. Bookmark the permalink. Follow any comments here with the RSS feed for this post. Trackbacks are closed, but you can post a comment. 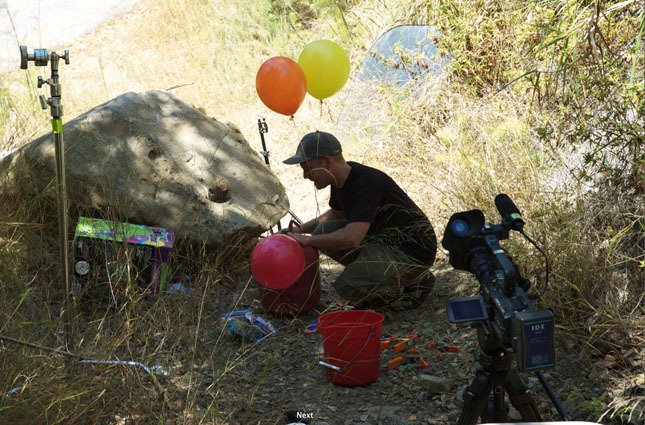 next time just use an air gun to pop the balloons in the air. They make little noise and probably don’t have to worry about any gun ordinances.